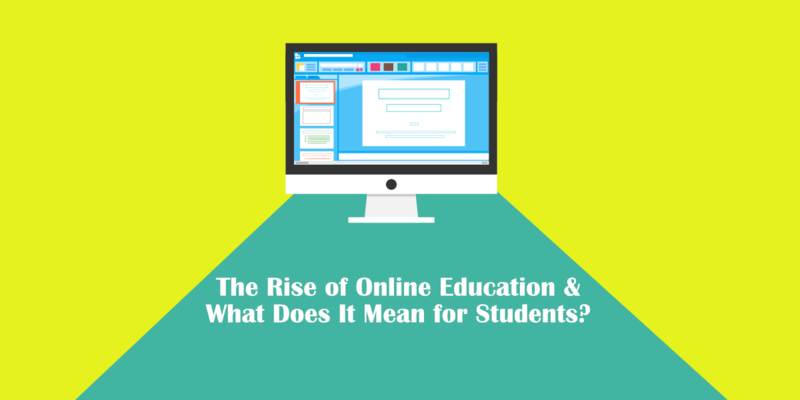 The Rise of online education - what does it mean for students? Online learning is becoming more popular these days. Many public universities and colleges across the country are now offering online courses to students. Many profit and non-profit companies also offer online courses with low price or for free to students around the world. There is no doubt that these changes are a product of advanced technology in the twenty-first century. Online learning has becoming popular because of its many benefits for students. Students can learn from the comfort of their own home and avoid travel expenses. It can be arranged to fit into life, family and work schedule. Online education can accommodate students with different learning styles. It is a convenient way to take courses though it may not be suited to all students. Also, online learning students are required to have self-discipline and steadfast commitment. Massive open online courses (“MOOCs”) are growing faster than ever before. Many companies now offer online courses from top universities such as Coursera, edX, Alison, and Open2Study. Some partner institutions also offer credit-eligible courses to attract more students to take online courses on their websites. More and more accredited online colleges appear on the surface to make use of the growing industry. While accredited online colleges are growing in size, many traditional colleges are also adopting the same practice. Many public universities and colleges are now offering online courses and distance learning programs to students who want to complete their degree while working full-time. Online courses don’t only require minimal resources, but they are also cost-effective for students. “While enrollments in higher education institution decrease overall, enrollments in online programs continued to increase. We have seen strong growth in online professional degree programs as learners are increasingly focused on employability and career advancement […],” said Todd Hitchcock, senior vice president, Online Learning Services, Pearson.1 In recent survey also shows that “more than one in four students (28%) now take at least one distance education course.”2 It is not surprising that more and more students sign up for online classes. What does the rise of online education mean for students? The internet is revolutionizing the way students learn and connect with others. While online higher education has a lot of advantages for students, it is not for everyone. Students who work full time may benefit from pursuing their studies online. But for students who are just exposed to the world of post-secondary education may find that traditional classroom is where they should experience. It allows them to network with peers on campus and meet with the instructors face-to-face allowing them to ask questions directly. And the most of all is that they can experience what the college has to offer. Online education means to open a new door to opportunities. It makes learning more engaging, more efficient, and more accessible to everyone around the world. But it does not mean the solution for everyone. In some cases, students are required to experience traditional classroom to succeed.